John Corona seemed enough to push his high school team to the top of the league in 1987, according to The Los Angeles Times. Pitching for Santa Fe High in California, The Times wrote Corona anchored the pitching staff as a lefty going into that season. "His presence," The Times wrote of Corona, "has a majority of the league's coaches predicting that Santa Fe will finish in the top three." Corona went on to make his presence known at Cerritos College and in the pros. His presence in the pros lasted seven total seasons. He made AAA, but didn't make the majors. Corona's career began in 1989, taken by the Cardinals in the 39th round of the draft out of Cerritos. 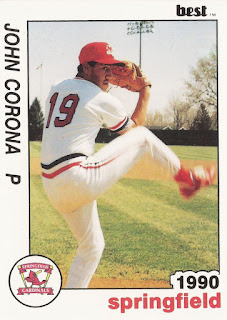 Corona started with the Cardinals in the rookie Arizona League. He appeared in 28 games, second in the league. He went 10.2 innings over six outings without giving up an earned run and saved five games. He moved to single-A Springfield for 1990, getting into 54 games and turning in a 3.71 ERA. Corona then divided time between high-A St. Petersburg, AA Arkansas and AAA Louisville in 1991. He gave up a two-run home run in a June game for Louisville. He pitched a scoreless ninth in an August win for Arkansas. Overall, he posted a 4.25 ERA on the year. Corona pitched in spring 1992, but he didn't play that season. He returned to St. Petersburg in 1993, then played at Arkansas in 1994 and to start 1995. He ended with sub-3 ERAs in 1993 and 1994, but gave up four earned in five innings in 1995. Corona played two more seasons in independent ball for Long Beach in the Western League, ending his career.